Michael “Shroud” Grzesiek, a popular PUBG Twitch streamer known for his skilled play and quick reflexes, recently played alongside a hacker. When fans noticed the hacker on Grzesiek’s stream and shared clips on social media, it sparked debate over what to do about top players fraternizing with cheaters. 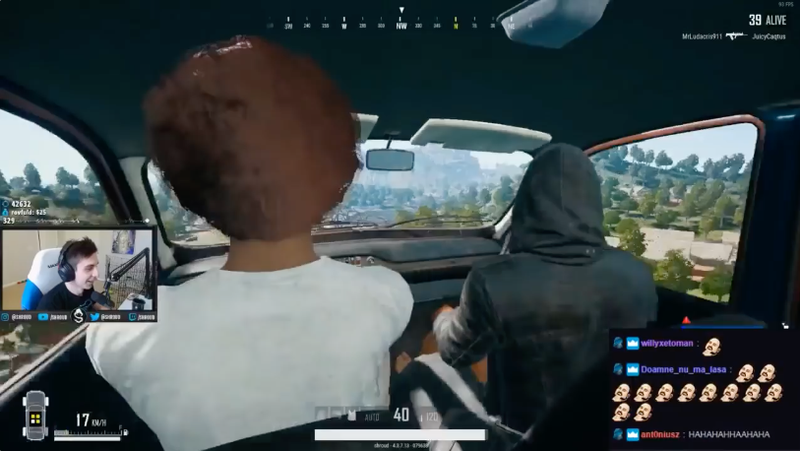 The video clip circulating around PUBG’s community shows Grzesiek and fellow streamer Wadu playing alongside a random hacker who is not part of their squad. The hacker flies cars around, using them to create makeshift barricades inside houses. Later, the hacker helps the pair of streamers by shuttling them through the air towards the next playzone. At one point, the hacker stops at a house and informs them that a player is inside. Shroud enters and kills the player. “I actually sell these cheats for for a living,” the hacker says before Grzesiek quickly shushes them. The pair fly off in the hacker’s car. Grzesiek jumps out over a river but dies upon impact with the water. Viewers have pulled Twitch clips of the incident, but the original archived stream is unavailable. Grzesiek’s Twitch channel boasts over three million followers, and his near-legendary PUBG skills have made him the de facto face of the game for fans. His popularity has also earned him an in-game shout-out; last month, PUBG added limited time weapon skins inspired by Grzesiek and fellow Twitch star Dr. Disrespect. Kotaku reached out to both PUBG Corp and Shroud but did not receive comment in time for publication. High profile streamers have faced bans for breaching the game’s rules before. In July last year, Dr. Disrespect received a temporary suspension after prominently teamkilling during a livestream. The incident prompted a response from designer Brendan “PlayerUnknown” Greene, who said, “In my house, you follow the rules or you GTFO.” Hacking has resulted in bans, and players have faced disciplinary actions for teaming up with enemy players. PUBG has always struggled with hackers that jump into games to mess with legitimate players and show off their cheats to prospective buyers. The game uses an anti-cheat system called BattlEye, which was first used in 2004’s Battlefield Vietnam. The anti-cheat provider has kept the public informed about how many players they’ve banned from the battle royale, announcing in February that the number had reached 1,044,000 players. Hackers remain prevalent in the game, however, and BattlEye sometimes flags innocent players, too. Seeing one of the game’s top players cruise around with hackers has left the community split on whether or not disciplinary action is warranted or if this is just a natural result of PUBG Corps’ struggles to optimize the game and cut down on hackers. As PUBG struggles to find a place in a changing battle royale market, many players have expressed frustration that the game can’t provide a smooth gameplay experience. Other players are skeptical that Shroud will face any consequences at all.